"I tried the new screen today on a 3hr jaunt around Durham and found the new screen to be a marked improvement, with no more buffeting on my visor or me having to bend over and lower my head in order duck the windflow. Good news as I am planning some touring this year. "My 2004 Fazer 1000 has the worst aerodynamics I can remember: noisy, tiring and the strange characteristic of making the rider’s head wobble from side to side when carrying a pillion. I’ve tried a double bubble and a close-to-standard Puig screen – no change. But the MRA adjustable blade design, which I’ve used for two months now, has impressed me. It delays the break up of the airstream by a very welcome few inches. The quietest setting is parallel to the main screen, but max height gives a shade more protection. Quality is outstanding, and it makes a rather dull-looking standard cockpit more interesting to sit behind." 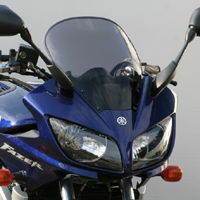 !quote, 37713, windshields, wind, shields, windscreen, motorcycle, motorbike, sportsbike, vision, vario, touring, screens, vario-screens, vario-shields, gray, grey, tinted, smoked, ecran, vent, pare-brise, 01, 02, 03, 04, 05, 2001, 2002, 2003, 2004, 2005, fzs, 1000, faired! Just to advise that the touring screen is now fitted to the bike and looking very good indeed. Thank you for your assistance with this purchase.